I was at the mall the other day and I noticed a woman wearing a burqa. I don’t see this a lot, but I do see it from time to time. I also sometimes see Muslim women wearing hijabs from time to time. The thought that I had when I saw the woman wearing the burqa was a strange one. My thought was that atheists are everywhere. How did I get from seeing a Muslim woman to the thought that atheists are everywhere? What is the connection there? It’s simple. In the United States of America, .6% of the population are Muslims. Assuming that the gender ratio is equal to the general population, .3 are Muslim women. “Confirmed atheists” make up 5% of the general population. So for every Muslim woman I see, there are at least 16 “confirmed atheists” floating around that I don’t see. Plus, there are tons of people who don’t identify as atheists who actually are atheists so that number is probably a great deal higher. I’m guessing that for every Muslim woman I see, there are about 20 to 25 atheists. For every Jewish guy wearing a yamaka, there are more than six “confirmed atheists.” Probably much more because most Jews don’t actually wear their yamaka except at synagogue services. So if I see a Jewish guy in the general public wearing a yamaka, that isn’t representative of all Jewish men, just the orthodox men. 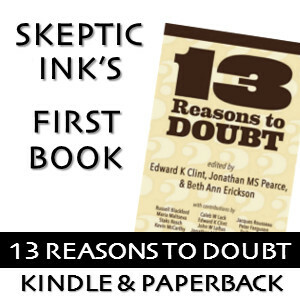 For every 16 Christians there is at least one atheist. So start counting crucifies and Jesus Fish on bumper stickers. Unlike many religious believers, most atheists don’t wear their atheism out in public for all to see. So people don’t see us and we don’t see each other. Over the years, I have gotten quite a few positive comments about my atheist bumper sticker and no negative comments. Atheists who were not generally active in our community found my bumper sticker and were glad to see it. Atheists need to start being more visible. This doesn’t mean we should create a new fashion statement or start wearing funny hats or an image of a torture device around our necks, but it does mean that we should start wearing our atheism on our sleeves more. We should start wearing shirts that support our ideas. We need to be more visible. Not all of those ideas need to be in-your-face either. I got this great shirt from Cult of Dusty that just says, “Logic” on it. I love that shirt because it isn’t in-your-face. Another atheist will see it and realize that I am probably an atheist with a shirt like that, but it isn’t going to get me punched in the face by some religious wacko (not that that has ever happened, but the fear of it is there). What slogans, shirt ideas do you have that you haven’t seen on t-shirts yet and would like to? 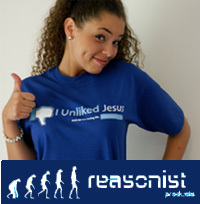 Do you have any stories of people coming up to you while you were wearing an atheist shirt? Comment below. I point this out only because many will dismiss your credibility based on a spelling mistake: Yamaka is actually spelled yarmulke. Atheists ARE everywhere. The internet is where religion goes to die. Yeah so many atheist that are scared of God. They want to be equal to him but can’t. God did something and now they hate him. He took a loved one, know they hate him. Yeah atheism, not me. I’m a theist. I believe in God. And you guys should to, especially you Staks, God is here and he is everywhere. Again, you can assert whatever you like, but it doesn’t make it true. Oh i am just speaking the truth now. Like God told me to. Let’s examine that claim. You claim you are speaking the truth like God told you to. 1. How do you know it is the truth? 2. How did God tell you? 3. Are you sure it was God? Because, God will always tell you what is right, and you don’t have to do it, but i heard it in the back of my head, and i knew what to do. Let me repeat the questions… especially that third one. How do you know what you are hearing is God, and not just you? How do you know that the voice you are hearing in the back of your head is God and not just your subconscious? Because I know, he is always there telling me what to do, and when he talks I’m happy, i may be having a bad day, then i just hear a vice and i always feel a wave of happiness come over me.